2016 Veterinary Spending was $18.12B- Where did it come from…? Now we will move to the Service Segments – first up is Veterinary Services. We’ll see some big differences from the Product Segments. Veterinary Services prices have had years of high inflation. This has resulted in CU income becoming the most dominant factor in spending behavior. We’ll see the impact of this in many demographic categories. Veterinary Spending is also affected by the spending behavior in other segments. In 2015 Consumers spent $5.4B more on Pet Food. They helped pay for this by spending $0.47B less on Veterinary Services. In 2016, things turned around as Consumers value shopped for premium foods but spent $1.01B more on Veterinary visits. This lift more than made up for the drop in 2015 and got this segment back on the right track. Regular Veterinary care is definitely “needed” but the skyrocketing prices have forced many Pet Parents to delay or even forego procedures, which is an unfortunate result. Let’s see which groups were most responsible for the bulk of Veterinary spending in 2016 and the $1.01B increase. The first chart details the biggest pet Veterinary spenders for each of 10 demographic categories. It shows their share of CU’s, share of pet products spending and their spending performance (Share of spending/share of CU’s). The differences from the product segments are immediately apparent. In order to better target the bulk of the spending we had to alter the groups in two categories – income and occupation. Another big difference is the performance level. 8 of 10 groups have a performance level above 120%. This compares to 5 for Supplies and only 4 for Food. It means that these big spenders are truly performing well but it also signals that there is a far larger disparity between the best and worst performing segments. Income is absolutely the biggest factor in Veterinary Spending. The categories are presented in the order that reflects their share of Total Pet Spending which highlights the differences of the 8 matching categories. Race/Ethnic – White, not Hispanic (92.0%) This group accounts for the vast majority of spending in every segment. However, the 92% share is extraordinary. The 131.9% performance rating ranks #3 in terms of importance in Pet Food Spending demographic characteristics and reflects the spending disparity. 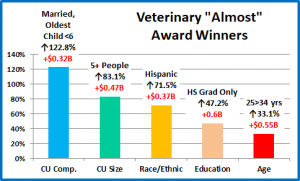 Hispanics, African Americans and Asian American account for over 30% of U.S. CU’s, but they only spend 8% of Veterinary $. This result comes from a mixture of two factors – lower income and reduced pet ownership, which especially impacts African Americans. Housing – Homeowners (81.7%) Homeownership is a major factor in pet ownership and spending in all industry segments. In terms of importance to increased Veterinary spending, the 131.0% performance rating puts homeownership in 4th place. The Homeowners’ share of market fell sharply from 88.4% in 2015. This is directly related to the increased spending by younger generations who are less likely to own a home than older Americans. # in CU – 2+ people (79.4%) The share of market for 2+ CU’s is very close for all segments. Their overall Veterinary spending performance of 112.9% is the lowest of any category and one of only 2 with a performance below 120%. CU’s with 2 to 4 people still perform best. However, in 2016 CU’s with 4+ people increased their spending, while those with 1 to 3 people spent less. This reflects the increased spending of younger families which has helped to make Veterinary spending a little more balanced across segments in this category. Education – Associates Degree or Higher (74.1%) Income generally increases with education. It is also important in understanding the need for regular Veterinary care. We see the effect of this in the large market share for this group and a performance of 143.2%, making higher education the 2nd most important factor in Veterinary spending. # Earners – “Everyone Works” (69.2%) In this group, all adults in the CU are employed. The 69.2% market share of Veterinary $ is the largest share for this group in any segment. This and a performance of 120.1% reinforce the importance of income to Veterinary spending. However, this performance rating is relatively low for this category, 8th place. CU’s with 2+ people and only one earner and retired people still spend a lot of Veterinary $. Age – 35>64 (65.5%) Veterinary Spending has skewed more towards older groups. In 2015 over 75% of the spending came from those over 45. In 2016 the Gen Xers and Millennials stepped up their commitment to Veterinary services. The 35>44 year olds passed the 65>74 group in spending so the dominant group became 35>64 years old. Their 121.0% performance level is above the 120% benchmark but it is down 6% from 128.5% in 2015 and is only in 7th place. Veterinary spending is becoming a little more balanced across age groups. Occupation – I’m the Boss (64.4%) –“I’m the Boss” is a group which includes Managers & Professionals, Self-employed and retired people. Income and “control” are clearly key factors in Veterinary spending and this “bossy” group has a bigger market share and better performance than all wage and salary earners.The 128.3% performance of this group ranks them 5th in importance for spending and shows the disparity between “bosses” and workers. Income – Over $70K (63.0%) We changed this group from over $50K because Veterinary Spending is so affected by CU income and the $70K level is where the behavior changes. The $50>69K group has a performance rating of 73%. The $70>99K group performs at 111% and performance continues to grow with higher incomes. The 170.1% performance clearly shows that higher income is THE most important factor in increased Veterinary spending. Area – Suburban (62.3%) Suburban CU’s are the biggest spenders in every industry segment. Their performance of 113.6% is relatively low for the Veterinary segment and reflects the strong spending growth in Central Cities. CU Composition – Married Couples (61.3%) Married couples are an important segment for the Pet Industry – with a big market share and 120+% performance in all segments. Their performance of 126.2% puts them in 6th place in terms of importance to Veterinary spending. We changed 2 of the spending groups for Veterinary to better target the biggest spenders. Higher income is by far the biggest single factor in Veterinary spending. We see the impact of this in many groups as it often contributes to the big spending disparity between segments. Spending Disparity may be the norm in this segment. 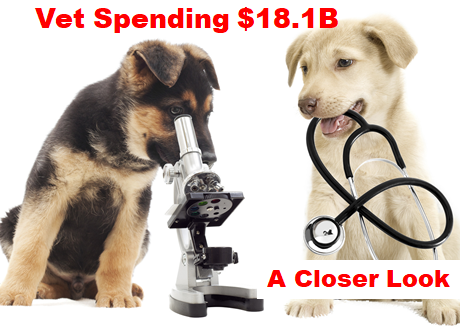 Consider the fact that the Veterinary segment has 8 big spending groups with a spending performance of 120+% . Supplies had 5 and Food only 4. Now, we’ll look at 2016’s best and worst performing Veterinary spending segments in each category. Income – The 325.3% Performance by the $200K> group is 32% higher than last year’s 245.5%. As Veterinary prices continue their strong inflation, income is becoming even more important in spending behavior. Last year’s loser was the $30>39K group. They had a major cut back in Veterinary spending as they upgraded their Food. Money matters. Age – The 55>64 year olds are back on top. They cut back on Veterinary spending to upgrade their food in 2015. In 2016 they value shopped for food and spent a little more at Veterinary clinics. # Earners – In 2015, all 1 earner and no earner CU’s performed below 100%. In 2016, the 1 earner, 2+ people CU’s passed 100% due to the younger crowd. The No earner, singles replaced the 1 earner, singles at the bottom. Race/Ethnic – Last year’s “loser” was Hispanic Americans. In 2016 African Americans’ Veterinary spending performance fell to 15.5%, which was the lowest performance by any group in any industry segment. # in CU –In 2015 the worst performer was CU’s with 5+ people. In 2016 the younger families increased their Veterinary spending and singles fell to the bottom. Region – In 2016 only the Northeast and South spent less. The Northeast stayed #1 but the South fell to the bottom. It’s time to “Show you the money”. Here are segments with the biggest $ changes in Veterinary Spending. # Earners – The formula for success in this category in 2016 was very simple. CU’s of any size in which all adults worked, spent more. All other CU’s spent less. Comment – In 2015 we saw the impact of the food upgrade on this category. Every segment that had increased Food spending had a decrease in Veterinary and vice versa. In 2016 we got back to a more normal pattern which reflects the importance of income in Veterinary Spending. Area Type – Every category segment that was down in 2015 was up in 2016 and vice versa. Comment – Central City bounced back from a $0.89B drop in 2015 and is now up $0.88B since 2014. Occupation – In 2016 the winner and loser from 2015 swapped positions to produce a more expected result. Comment –2016 saw at least a small increase from all occupations except Construction workers/Laborers and retired people. Their 2016 spending drop came after both of these groups had big increases in 2015. Housing – The increase by the renters is being driven by the younger CU’s and Central City. Comment – The biggest concern is that Homeowners with a mortgage have the largest share of market (53.9%) and the best performance (150.6%) of any segment but they have spent $1.32B less since 2014 – down 11.9%. Education – Those with a BA/BS or Associates degree are the big drivers – Up $1.67B in 2016 and $2.03B since 2014. Comment: Only 3 people CU’s had decreases in both 2015 and 2016 and they are down $1.2B since 2014. For every other segment, those that were up in 2015 were down in 2016 and vice versa – a topsy turvy year. 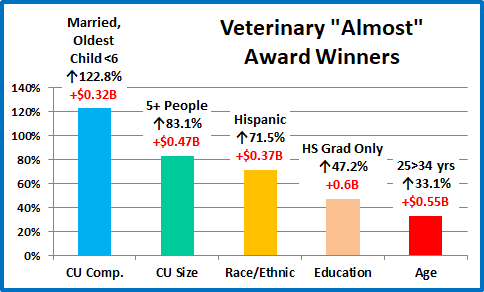 Race/Ethnic – The White, Non-Hispanic share of Veterinary $ is 92.0%, up from 90.6% in 2015 – a huge disparity. Comment – The White, non-Hispanic group has the only consistent growth. Hispanics and Asian Americans have an up and down pattern. African Americans are a concern. Their Vet spending is down $1.18B (76.6%) since 2014. Age – In 2016, the 35>44 and 55>64 age groups were up $1.58B, but in 2015 these groups were down $2.07B. Comment: Veterinary spending is showing a youth movement. The 25>34 age group was the only segment to have increased spending in both 2014 and 2015 and registered the biggest increase from 2014, +$0.79B. All the age groups under 45 had a total increase of $1.54B in 2016 over 2015. CU Composition – The big turnaround by last year’s loser correlates with the spending lift by the 35>44 age group. Comment – The biggest lift in 2016 came from Married Couples with their oldest child under 18. Among married couples, if you had a child over 18 or no children at home, you spent less. The only segment with 2 consecutive years of increases was Unmarried, 2+ adult CU’s. Their Veterinary spending was up $1.15B, 68.0% from 2014. Veterinary spending was up $1.01B in 2016. The increase more than made up for the $0.47B drop in 2015. Demographically, it was evenly split, as 41 of 82 segments (50%) spent more. The “almost” winners in the chart reinforce the performance of the younger Americans and show that you don’t need to have a College degree to take your Pet to the Vet. The Hispanics also bounced back after a tough 2015. These 5 segments didn’t win any awards but their combined Veterinary spending increase totaled $2.31B – impressive! In 2015 the huge spending increase generated by consumers who opted to upgrade to Super Premium pet food was partially paid for by decreases in spending on Veterinary Services (-$0.47B) and Supplies (-$2.1B). In 2016 consumers looked for the best price on their Food and the Veterinary segment got their money back and more with a $1.01B increase. This was much better than Supplies which regained less than half of the lost ground. Veterinary services and spending should be a definite need, like Food, but there are many indications that it is becoming more discretionary, at least among demographic segments with low or even middle incomes. 50% of all CU’s have an income of $50K or less. In 2013 they generated 33% of all Veterinary spending. In 2016 it was 18%. But it is just not the lowest incomes. 77% of U.S. CU’s have an income of $100K or less. Their share of Veterinary spending is down from 70.4% in 2013 to 54% in 2016. Money shouldn’t matter so much in a category that is so important to the health and well-being of our pet companions. As a reaction to the rapidly rising prices, many Pet Parents are choosing to delay or even forego entirely some Veterinary services. They are also actively seeking alternatives. We have seen this in the meteoric rise of medications and supplements, especially in treat form, and even at retail, where some outlets offer a “Veterinary day” when consumers can bring their pets to get services like vaccinations at big discounts from clinic prices. The big players in these groups all generate increased Veterinary spending and are categories in which the consumer can exercise some degree of control. The Racial/Ethnic and Age Categories also have high performers but consumers have no control over inclusion in these groups. The performance of segments within these categories allows industry participants to target both their best customers as well as those most in need of improvement, but it also truly highlights the tremendous demographic disparities in Veterinary Spending. The youth movement – younger groups showed their commitment to their pets through increased Vet spending. Urbanization is happening in Veterinary spending too, with an exceptionally strong performance by Central City. Finally – The “Ultimate” Veterinary Services Spending Consumer Unit consists of 3 people – a married couple, with their 18+ year old child. They are in the 55 to 64 age range. They are White, but not of Hispanic origin. At least one of them has an advanced College Degree. Everyone works in the household. The parents have their own business which is doing well, generating an income of over $200K. Their child works part time while going to school. They live in a small suburb, adjacent to a big city in the Northeastern U.S. and are still paying off the mortgage on their home.